Today we saw the biggest annual fall in unemployment in 25 years – and the biggest annual fall in youth unemployment since records began. Yes as you have stopped benefit clams of disabled people, pushed people to setup their own business or forced people on zero hour contracts that offer no security at all! Being able to find a job is the most important way to improve people’s standard of living. I agree so why have I had a 3year battle to get my job back. Our long-term economic plan is helping to create more real jobs and giving more people the security of a pay packet to provide for themselves and their families. 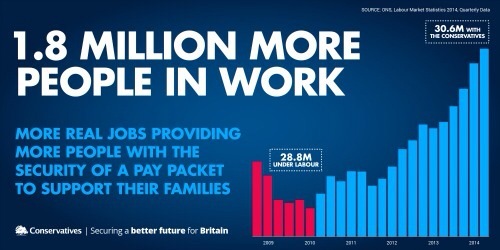 yet use of food banks is up & so is the number of in work people on benefit. Labour’s Great Recession led to the biggest economic crash in living memory. so the world wide crash was caused by Labour, not the bankers. Who new? People lost their jobs, and families were hit hard. We’re fixing the mess they left behind. By backing Britain’s businesses – cutting the jobs tax, cutting red tape, and investing in vital infrastructure like roads, rail and broadband – we’ve helped create 1.8 million more jobs. fantastic! Want to fix the pot hole at the end of my rode. And Labour still haven’t learnt their lesson. They’re planning to increase the jobs tax – hitting small and medium-sized businesses and putting jobs at risk. How many court cases have you lost? Share our graphic on Facebook and Twitter today, and let everyone know that while Labour costs jobs, the Conservatives create them.